This month, the NAPP Photo Rally had "Trees" as one of their categories. There's so many things you can do with that category, it's not even funny. My initial thought was to take a shot of a lone tree in a field, and have the tree composed on the left side, showing all the empty space on the right, and convert it to black and white. I even had seen the tree I wanted to take last week, and was headed off to shoot it, but decided to stop at the bank first. On my way out of the bank, I noticed a fence separating the bank from a trail/pond/office building area, and noticed a few freaky looking trees. I think most trees like this look pretty freaky int he winter without any leaves, but I figured it was a good shot to take. In case you think I went onto private property (ie. crossed the fence) to take the shot, I'll note that I could only cross the fence, if they actually...well...finished the fence. There was a fence next to the bank, but if you took 2 steps away from the bank, they neglected to actually put another side of the fence up. Way down by the pond I did see a "private property" sign, so I just stood where the fence would've been had the rest of it been there, so technically I was still on bank property. 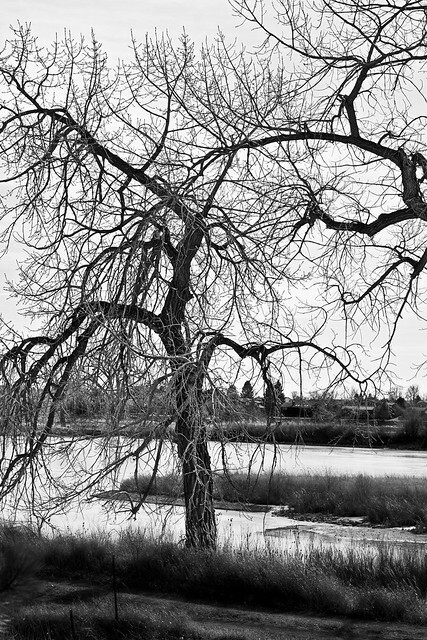 The picture looked pretty normal once I took it, but then I decided to convert it to black and white, and then I noticed the tree looked kind of scary once I did that. Either that, or I've been watching too many movies lately. I'm not a huge fan of black and white normally, but in this case, I think it works. Also this serves to note that you never know what photo opportunities you can find close to your house, until you look for them.